What Is a Graph? Paths, Cycles, and Trails. Vertex Degrees and Counting. 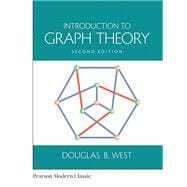 Directed Graphs. Basic Properties. Spanning Trees and Enumeration. Optimization and Trees. Matchings and Covers. Algorithms and Applications. Matchings in General Graphs. Cuts and Connectivity. k-connected Graphs. Network Flow Problems. Vertex Colorings and Upper Bounds. Structure of k-chromatic Graphs. Enumerative Aspects. Embeddings and Euler's Formula. Characterization of Planar Graphs. Parameters of Planarity. Line Graphs and Edge-Coloring. Hamiltonian Cycles. Planarity, Coloring, and Cycles. Perfect Graphs. Matroids. Ramsey Theory. More Extremal Problems. Random Graphs. Eigenvalues of Graphs. Appendix B: Optimization and Complexity. Appendix C: Hints for Selected Exercises. Appendix D: Glossary of Terms.